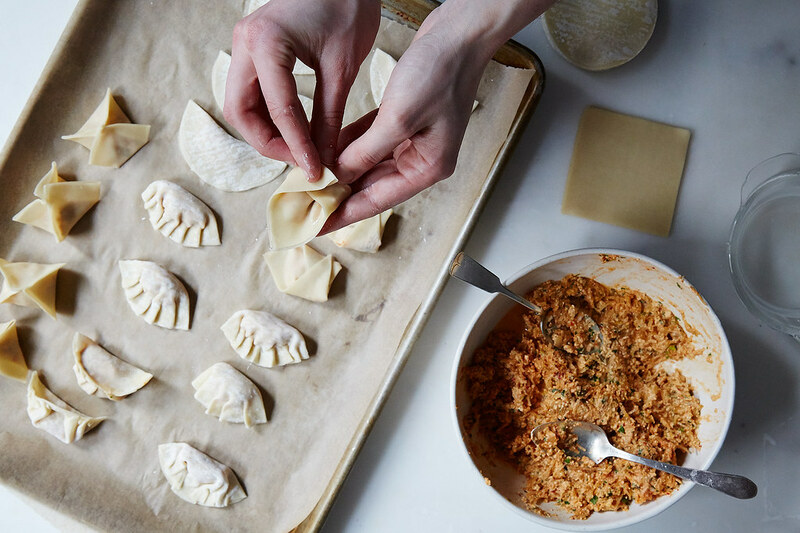 Here at Food52, we love recipes — but do we always use them? Of course not. Because once you realize you don't always need a recipe, you'll make your favorite dishes a lot more often. 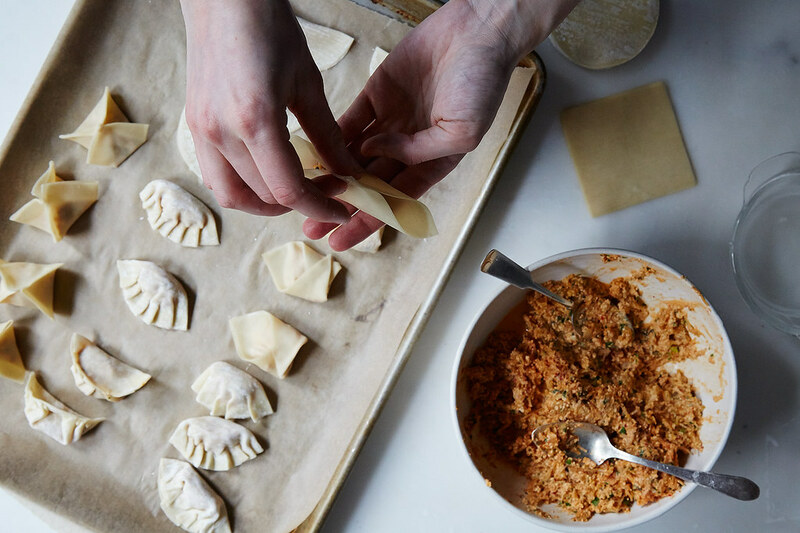 Today: Let your creativity, not a recipe, guide you as you learn how to make dumplings. 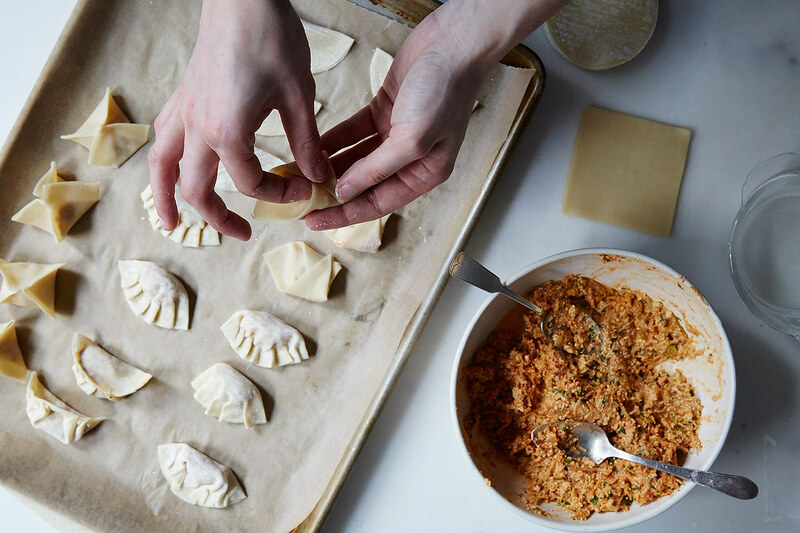 When you think about dumpling-making as an edible art project, you understand why creativity and a little time — not a recipe — are all you really need. 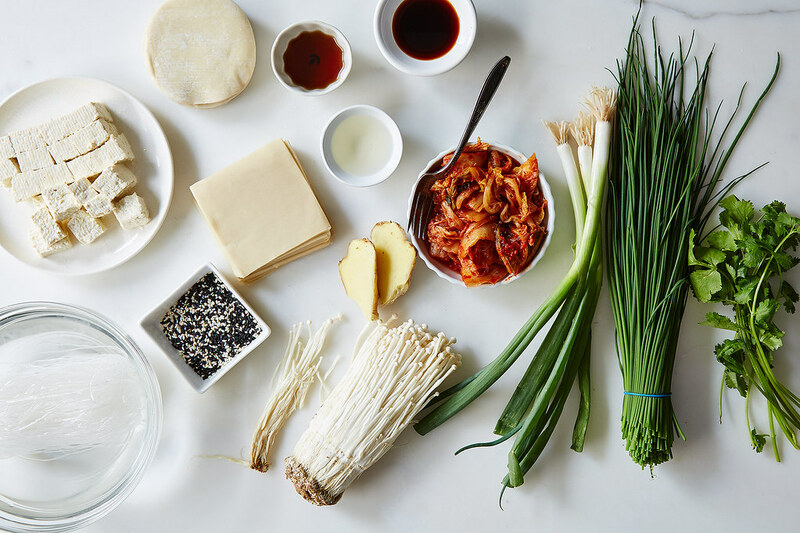 First consider the materials (in food terms, the flavor profile): The dumplings can be subtle, filled with shrimp and corn, or made bold by kimchi or watercress. Then, there’s the process: How do you want to fold your wrappers? Once you’ve spent some time crafting your works of art, there’s the cooking to think about — steam, boil, or pan-fry — and finally, the dipping sauce (hot sauce? soy-chili sauce? peanut sauce?). 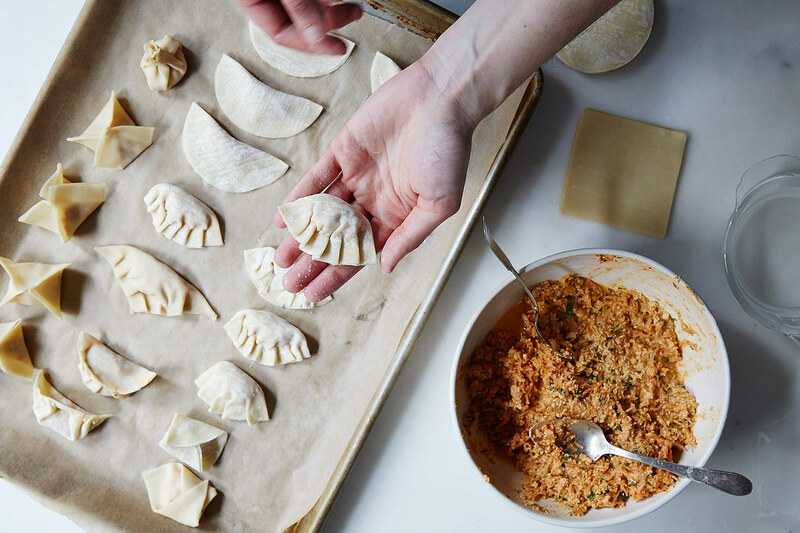 When all of your creative energy is spent, your finished masterpieces needn’t be rarefied: Stick them in the freezer so they are on-hand in case of emergency (they’re loads better than store-bought frozen dumplings). 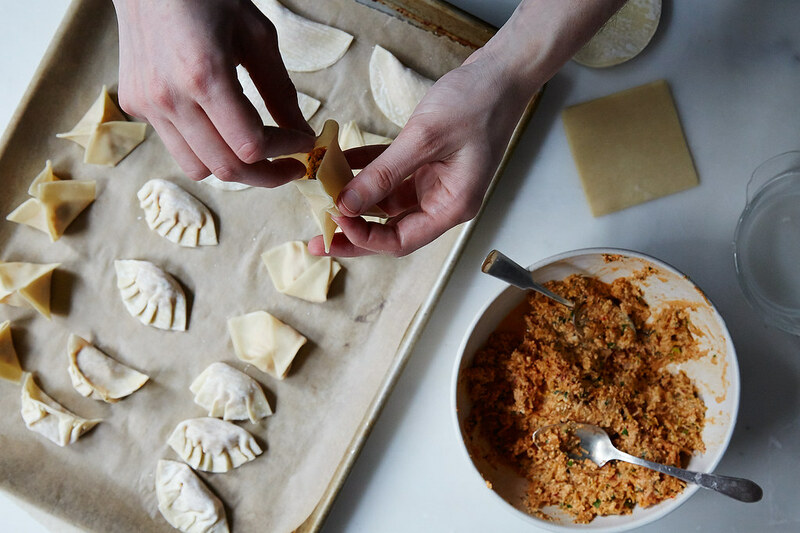 Or devour them en masse, showing off your craft by hosting a dumpling party. This is art for the people. Perhaps most importantly, you'll also need a combination of protein, vegetables, alliums, and other fun add-ins for your filling. 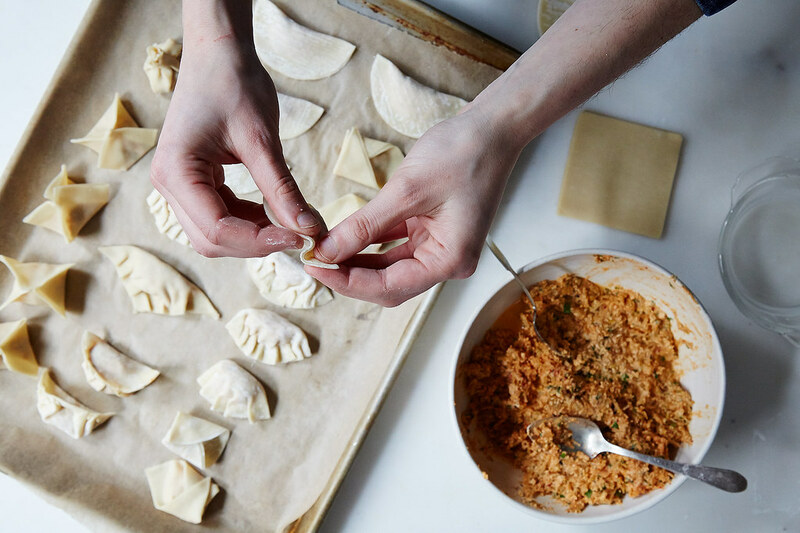 Pick at least one item from the following categories, with protein and vegetables making up the bulk of your filling (and I’d recommend always sticking in scallions, chives, cilantro, and ginger — your dumplings will almost always pop when those four ingredients are involved). For our filling, we used tofu, kimchi, ginger, enoki mushrooms, chives, cilantro, scallions, and bean thread noodles. Once you've picked out your ingredients, you'll need to do a bit of estimating. You'll want about 1 scant tablespoon of filling per wrapper. If you’re buying wrappers, you'll be aiming to make about 4 cups of filling. (If you're making your own wrappers, I'll leave the math up to you, overachiever.) Pick out the ingredients you like, then measure the bulky items (the protein and the vegetables) to see if you’re close to 4 cups total. Even though measurement is going to change after you put the mixture in the food processor, it’s still good to start close to 4 cups so you don’t run out of or waste too much filling. Once you've eyeballed the ingredients, you'll need to cook anything that might still be raw after the 6 to 10 minutes it takes to steam, pan-fry, or boil the dumplings. The specifics are noted in the list above, but keep in mind that you'll want to cook ingredients like bean thread noodles, lentils, mung beans, split peas, and pumpkin (along with any others you want to guarantee are fully cooked). Now roughly chop any large ingredients (like tofu, cabbage, pumpkin, etc.) so that they can be broken down uniformly in the food processor. Throw all of the ingredients into the machine and add flavorings: black pepper, soy sauce, red pepper flakes, sesame oil, and rice vinegar. You can eyeball it (you’ll have an opportunity to correct them in a second). Process until the mixture is combined but still has some texture (as if you were making meatballs). Taste the mixture (as long as there's no raw meat involved) and adjust seasonings as needed. Then, if you have time, transfer the filling to a bowl, cover it, and let it sit in the refrigerator for 30 minutes so all the flavors can meld together. Gather your filling and your wrappers, then line a baking sheet with parchment paper and fill a bowl with water. Place the wrapper on a floured surface or hold it in the palm of your non-dominant hand, then place 1 scant tablespoon of filling in the center. Dip a couple of fingers into the water and wet the rim of the wrapper. 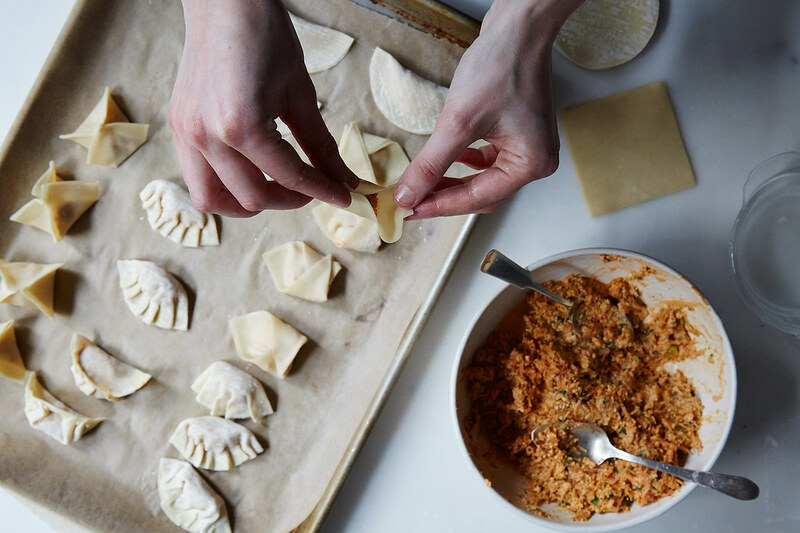 Whether you’re using square or round wrappers, you can fold your dumplings four different ways (there are other options, but these are a good place to start). Each method has its own personality — and level of difficulty (our list moves from easiest to most difficult). 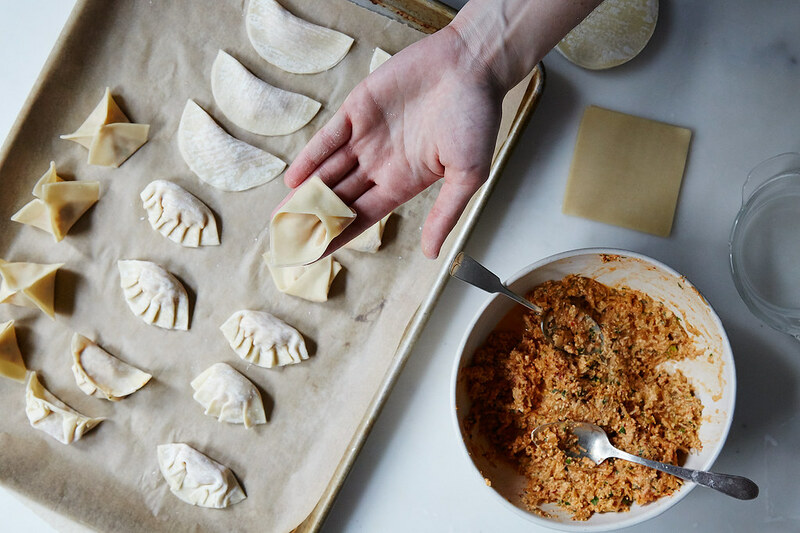 Once you’ve folded a dumpling, set it on the prepared baking sheet while you work on the others. a) Half-moon: Fold the dumpling wrapper in half and press the edges together to seal. Make sure you get any air bubbles out of the inside. <img width="1024" alt="" src="https://farm8.staticflickr.com/7597/17185124462_1343f92809_b.jpg" class="article-body-image"/>b) Big hug: Besides the half-moon, this is the easiest option. 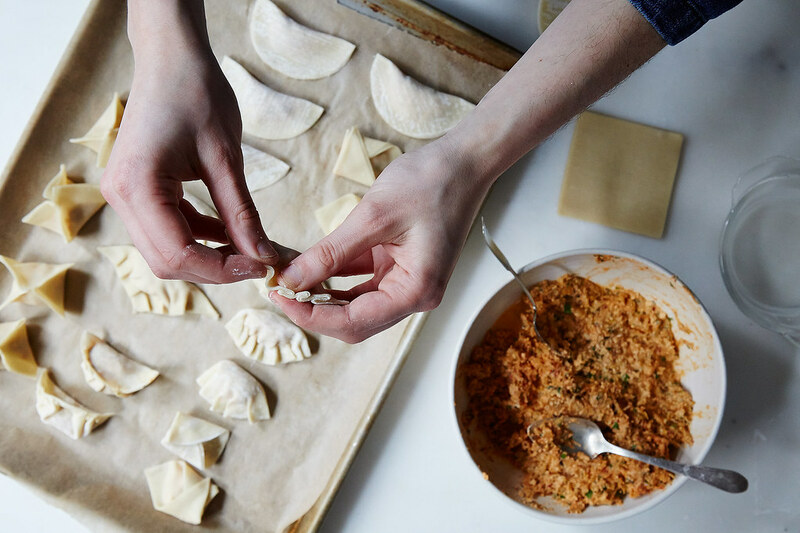 Fold the dumpling into a half-moon, as described above, take the outer “arms” of the dumpling and fold one on top of the other in the center of the filling. Add a dab of water where the arms meet, and press to seal. c) Crimp, a.k.a. 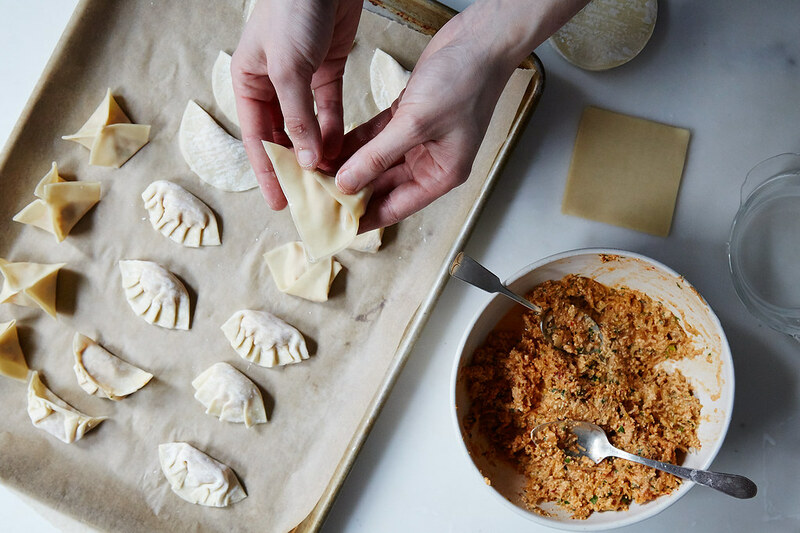 make lots of pleats: Seal the dumpling like you did for the half-moon. Then, starting at one edge of the dumpling fold and using your thumbs and index fingers, crimp all the way to the other edge. Think of it as making a Z and then flattening the Z onto itself so it becomes a squiggle. d) Pouch: Bring two opposite sides of the dumpling wrapper to meet atop the filling. Hold them together with your thumb and index finger. Then, with your other hand, bring one of the other sides to the center, hold the point with the hand holding the dumpling (3 sides will be sealed), then do the same with the final side. Pinch the sides of the wrapper together so they’re sealed. 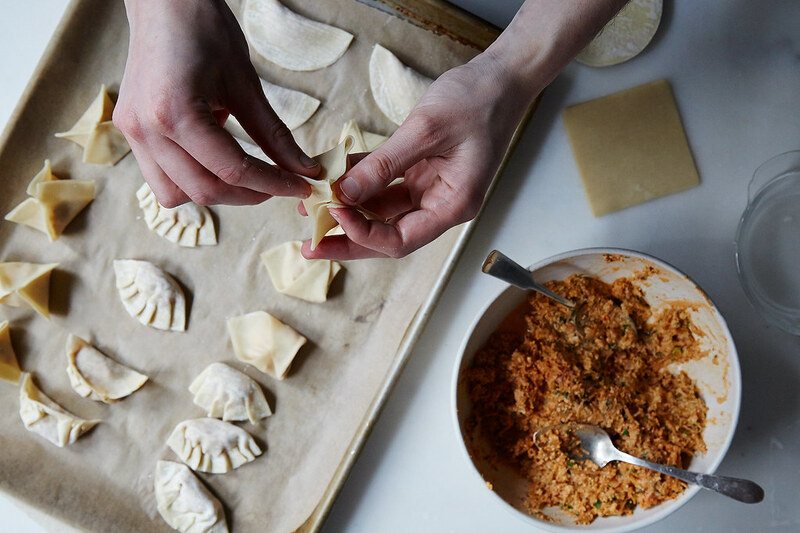 If you plan to eat some of your dumplings without freezing them, you are smart. You can steam, pan-fry, or boil in water (or directly in soup). To steam: Fill a lightly oiled bamboo steamer basket with dumplings. Cover the steamer basket, then place it over a pot of simmering water, making sure the basket sits safely above the water line, and cook for about 6 minutes. To pan-fry: Heat a pan over medium heat until a drop of water sizzles when added. Add a few tablespoons of any sort of oil with a high smoke point: Peanut or sesame is traditional, but vegetable or olive also does the job. Let the oil heat for a minute or so, then add your dumplings, making sure they aren’t touching. When the bottoms are golden brown, flip the dumplings (it will be harder to brown those that do not have two flat sides, like the pouches), then add a few tablespoons of water to the pan and cover. Once all the water has evaporated and you hear crackling instead of bubbling, take the lid off and transfer the dumplings to a plate. To boil: Bring a large pot of water to a boil. Gingerly plunk your dumplings into the water. Once they come to the top, let them cook for 6 more minutes, then, using a slotted spoon, transfer them to a plate or directly into soup. 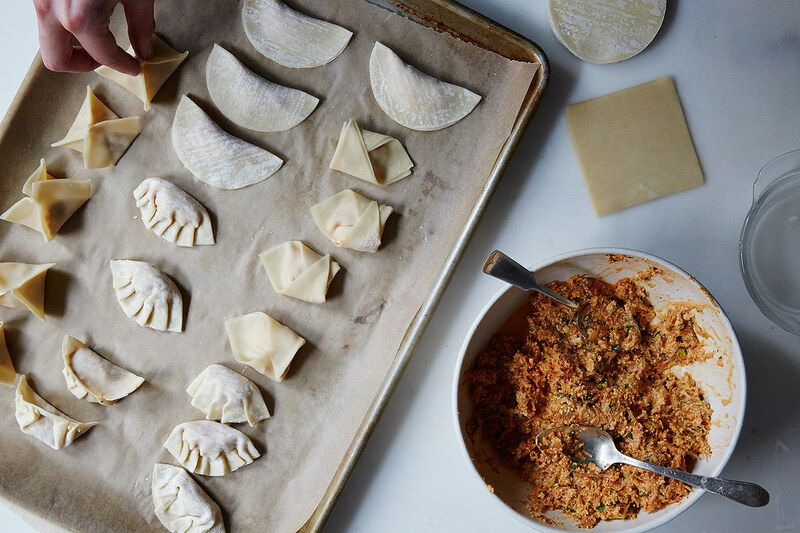 If you've frozen your dumplings, some extra preparation might be necessary. 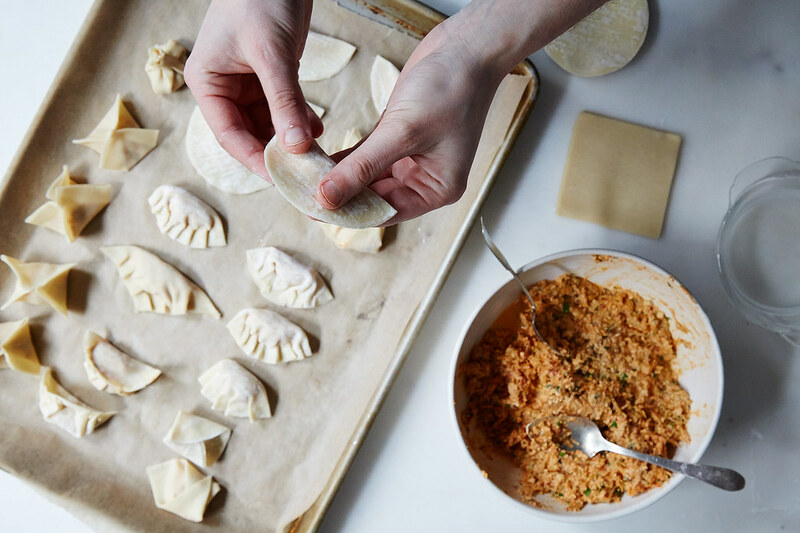 While many hurry and cook dumplings directly from the freezer, Asian Dumplings author Andrea Nguyen recommends thawing your dumplings for 10 to 15 minutes before you plan to cook them to prevent the dumplings from clumping and sticking to the bottom of the pan. J. Kenji López-Alt at Serious Eats prefers to add his frozen dumplings to a shallow bowl with a small amount of water, cover the bowl, and microwave for about 3 minutes, until the dumplings are cooked through. Then, he drains the dumplings for 15 seconds and pan-fries them until golden brown. 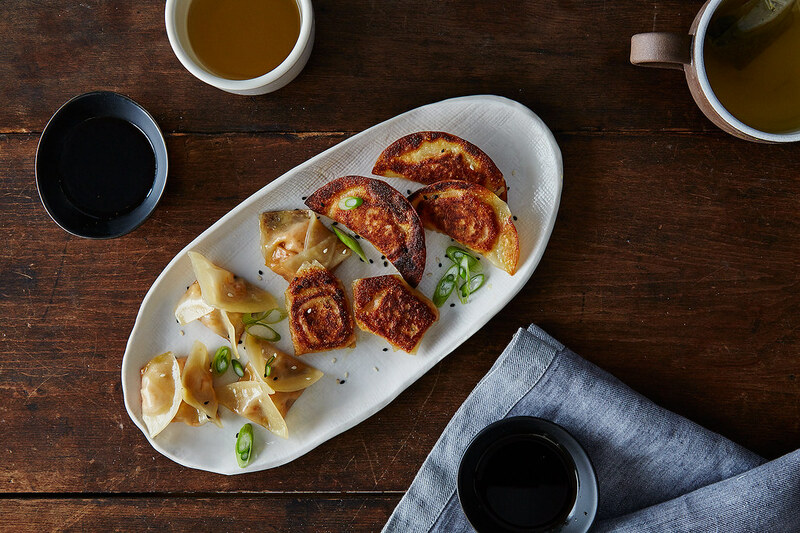 Once your dumplings are cooked, mix up a quick dipping sauce of soy sauce, rice vinegar, sesame oil, chile paste like Sriracha or gojuchang, and/or sesame seeds. Dip one dumpling, then another, and another.